The SS Princess was built in Winnipeg by shipbuilders Jarvis & Burridge in 1881. Built in the image of the paddle wheelers of Mississippi, her two side paddles could push her across Lake Winnipeg at 25 knots. With her 40 passenger cabins, she transported passengers in style. The Princess was named the finest vessel west of the Great Lakes and east of the Rockies. SS Princess in her prime. Manitoba Archives. In 1885, the ship sailed to Grand Rapids, Manitoba with the SS Colville to help transport one thousand soldiers who participated in the North West Rebellion to Winnipeg. Later that year, she was downgraded to a cargo vessel. Her 34 of her passenger cabins were removed, her side paddles were removed and replaced with a 4-blade prop, and her old steam engine was taken out and a new one installed. The new crew was left with 6 cabins, a kitchen and small dining room. The Princess now shuttled bulky goods and railway ties across the lake, and towing barges. In 1906, Captain John Hawes was at the helm of the Princess. On August 24th she sailed from Spider Islands, heading in the direction of Berens Island, a route she had sailed many times before. Two days into her sail, a storm blew up. As the waves and winds increased, the crew pleaded with Capt. Hawes to turn the ship and seek shelter in the shadow of George Island. The Captain pressed on, until finally the waves were cresting at 8 metres. Finally, he conceded that the ship should retreat from the storm, and sent the double order to turn the ship at full speed ahead. SS Princess fighting the storm. 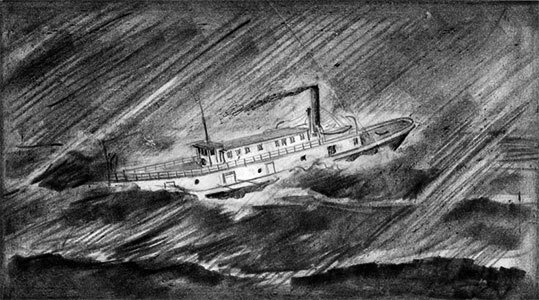 Sketch from Manitoba Archives. This proved to be a fatal error. The waves ripped the hull apart, causing the ship to founder and trapping some of the crew below decks. Passengers and crew rushed to the lifeboats, two of which were able to safely get away and make it to shore. Unfortunately, not all were so lucky - the death toll was six, with only two bodies ever being recovered. One of those bodies was of the Captain, who was found wearing only the straps from his life belt - the force of the waves had ripped everything else away. The lifeboat survivors were washed ashore at Berens Island and Berens River, and were later rescued by the SS City of Selkirk. Images this week came from the Manitoba Archives, via Red River Ancestry.